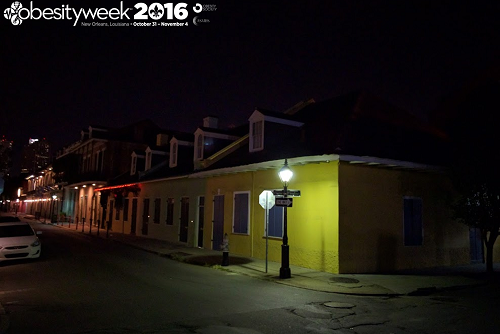 ObesityWeek in New Orleans was a feast of new information and perspectives for people who devote their careers to understanding and solving the challenge of obesity. The highlights were many and different for every attendee. Here are ten for your consideration. Sadaf Farooqi delivered a keynote address that mixed good humor with serious science about the genetic basis for energy balance and obesity. She used a hilarious anecdote about Prince Phillip to make a sly reference to weight bias. Describing the impact of leptin, the clarity of her presentation drew gasps from the audience. “I ♥ this woman. Extensive research results and lively, humorous presentations are not mutually exclusive,” said Pamela Davis. Click here for a recap. Weight Bias was a focus at the conference on many levels. Asheley Skinner chaired a fabulous symposium on Wednesday with Rachel Goldman, Nanette Adams, Kimberly Gudzune, and Trina Histon. 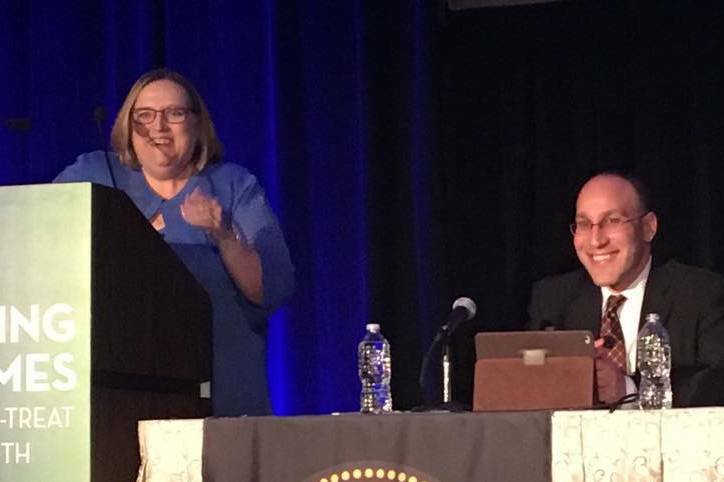 Patty Nece and Scott Kahan addressed the subject with broad smiles at a symposium Wednesday night. And then Jason Fung delivered an inadvertent demonstration of heinous weight bias through Twitter. His offensive, insulting tweets about two keynote speakers prompted immediate, sharp rebukes and an excellent commentary from Julia Belluz on Vox.com. Access to Care received considerable attention. An ASMBS symposium on Wednesday was filled with memorable presentations by a wide range of speakers from ASMBS, TOS, and OAC. Robert Michaelson presented especially compelling guidance for bringing change. Oral presentations on Thursday afternoon presented important new data on the problem and attracted media attention. Weight Regain after bariatric surgery frustrates clinicians and patients and thus, the symposium on the subject ran out of standing room on Thursday afternoon. Though the problem is frustrating, solutions come when clinicians and patients stop regarding surgery as “the finish line,” as Leslie Heinberg explained in a keynote discussion on Friday. Joint Sessions broke down some of the sharp lines between ASMBS and TOS programming on subjects ranging from basic research to long-term outcomes. Health Disparities flow from food marketing and health policies affecting diverse social, racial, ethnic, and economic groups. Shu Wen Ng and Jason Block chaired a fascinating symposium on the subject Wednesday. Presentations in a Tuesday session examined disparate effects of taxes and food marketing. Food Policy presentations by Kelly Brownell in a TOS key lecture and an ASMBS integrated health keynote address drew wide praise. Comprehensive Care Strategies were a theme that ran through many sessions. Integration of dietary, activity, pharmacologic, and surgical interventions plays an increasing role in delivering better outcomes. Results presented from the DROP program illustrate how effective this approach can be. Surgery and Pharmacotherapy command increasing interest as complementary strategies for achieving optimal outcomes. Lou Aronne’s presentation on the potential for pharmacotherapy to address post-surgical weight regain attracted a packed audience. Networking at All Hours was a feature with near universal popularity. The legendary Apovian/Bergman Lap Band attracted an enthusiastic audience that broke up just in time to take in the last game of the world series. Oysters, shrimp, and early-morning pastries in the French Quarter each had a strong fan base.